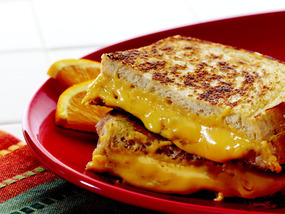 A classic grilled cheese sandwich is one of the iconic foods of childhood. And while plenty of people still enjoy a basic grilled cheese, many are looking for ways to take their favorite sandwich from the kiddie table to the grownup table. Of course, your choice of cheese is the key to the perfect sandwich. Different types of cheese will provide unique flavors and textures. Flavored cheese slices lay a tasty foundation for a wide variety of sandwich toppings. And certain cheeses, such as Borden Grilled Cheese Melts, are made specifically for their creamy consistency when melted. You can also change things up with different breads. Try pumpernickel, rye, seven-grain, sourdough or English muffin bread. Here are two recipes to excite your taste buds – they use Borden Cheese, made by a 100 percent farmer-owned cooperative. That means that 100 percent of proceeds go back to American dairy farm families. To find more deliciously cheesy recipes you can feel good about sharing with your family, visit www.FriendsofElsie.com. Spread one side of each slice of bread with butter. Then spread opposite side of bread with honey mustard. Place one slice of bread butter side down in skillet over medium heat. Layer one slice of cheese, ham and apple. Spread second piece of bread with honey mustard and place honey mustard side down on top of sandwich. Cook 6 to 7 minutes, flipping to ensure each side is golden brown and cheese is melted. Spread 1/2 tablespoon of butter on one side of a slice of bread and place butter side down in a skillet over medium heat. Top with one slice of cheese, then spread with marmalade. Layer second slice of cheese. Spread remaining butter on one side of second slice of bread, and place butter side up on sandwich. Cook 6 to 7 minutes, flipping to ensure each side is golden brown and cheese is melted.